Optical Surfaces Ltd. reports first solar light results has been achieved by the SPIRou spectrograph* which is installed at the Canada-France-Hawaii Telescope (CFHT). Chosen as a key supplier for this prestigious project – Optical Surfaces Ltd fabricated and delivered several key optical components of the SPIRou spectrograph, namely the twin ZnSe prisms and the Infrasil prism making the SPIRou triple-prism-train cross-disperser. 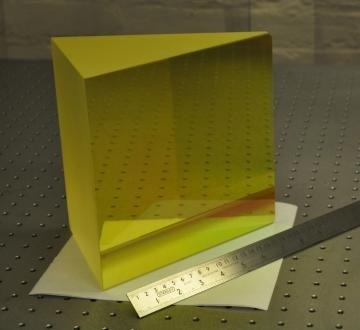 The large Infrasil prism and the twin ZnSe prisms were manufactured to demanding specifications, in particular regarding transmission, wavefront error and scattered light. The SPIRou spectrograph comprises a near infrared spectropolarimeter and high-precision velocimeter optimised for both the detection of habitable Earth twins orbiting around nearby dwarf stars and the study of forming sun-like stars and their planets. SPIRou is an heritage instrument developed from the knowledge gained from previous successful spectropolarimeters (ESPaDOnS and NARVAL) and high-precision velocimeters (HARPS), and consists of a high-resolution cryogenic Echelle spectrograph fibre-fed from a Cassegrainian achromatic polarimeter and calibration system. This project is managed in the framework of an international consortium led by France and involving, in addition to the Canada-France-Hawaii Telescope (CFHT), Canada, Switzerland, Brazil, Taiwan and Portugal. Dr Aris Kouris commented “Having supplied similar optics for the successful ESPaDOnS and FEROS projects, we have a proven record in manufacturing, mounting and testing precision optics for astrophysics projects”. He added “Our congratulations go out to the SPIRou team for collecting its first non-laboratory photons on November 15th and 16th by staring at the Sun for a couple of hours. This specific experiment allowed researchers to demonstrate that SPIRou reaches a spectral resolving power of 70000, and can measure polarimetric signatures down to sensitivities of 10ppm. Such outstanding performance can only be achieved utilising optical components of the highest quality”. Optical Surfaces Ltd. has been producing optical components and systems for leading astrophysics research groups for more than 50 years. The company’s ISO 9001-2008 approved manufacturing workshops and test facilities are deep underground in a series of tunnels excavated in solid chalk where temperature remains constant and vibration is practically non-existent. With such stable conditions testing, particularly with long path lengths, becomes quantifiable and reliable. Working with these natural advantages is a highly skilled team of craftsmen with a commitment to excellence in both product quality and customer service. For further information on demanding, high precision optics for astrophysics please contact Optical Surfaces Ltd. on +44-208-668-6126 / sales@optisurf.com.